Feldkirch (German pronunciation: [ˈfɛltkɪɐ̯ç]) is a medieval city in the western Austrian state of Vorarlberg on the border with Switzerland and Liechtenstein. It is the administrative center of the district Feldkirch. After Dornbirn, it is the second largest town in Vorarlberg in terms of population, with slightly more inhabitants than the state capital Bregenz. 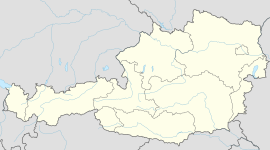 The westernmost point in Austria lies in Feldkirch on the river Rhine, at the northern tripoint border of Austria, Switzerland, and Liechtenstein. The beautiful medieval town, which remains well preserved to this day, was mentioned as a city for the first time in 1218, after Count Hugo von Montfort built the "Schattenburg", a castle which still is the major landmark of Feldkirch. Other sights in the town include the cathedral of St. Nikolaus from the late Gothic period. Feldkirch was the birthplace of Rheticus, and is currently the seat of the Roman Catholic Diocese of Feldkirch. From 1651–1773 and from 1856–1979, Feldkirch was the home of the Jesuit school Stella Matutina. March 1799 saw two clashes between the forces of the First French Republic and Habsburg Austria. On the 7th, Nicolas Oudinot with 9,000 French soldiers defeated Friedrich Freiherr von Hotze with 6,000 Austrians. The Battle of Feldkirch occurred on 23 March when André Masséna and 12,000 Frenchmen were beaten by Franz Jellacic and 5,500 Austrians. Feldkirch has had its own local bus network since 1993, which currently consists of 8 lines including buses to the north of neighbouring Liechtenstein. The bus system works together with Vorarlberg's bus system which provides several supra-regional lines starting and ending in Feldkirch. There's an additional line called "nightline" which connects different bars and discos all around Feldkirch. The nightline plies until around 4 a.m. on weekends. Feldkirch railway station lies on the main railway line through the Vorarlberg. As of 15 May 2001[update], 13,146 employees were employed by 1,464 companies in Feldkirch, including 5 large companies each employing more than 200 people. Feldkirch has one of the best preserved medieval cityscapes of Vorarlberg. The city was built around 1200 at the same time as the Schattenburg and has a geometric grid system. Since around 1500, when the city wall was rebuilt, the city remained unchanged over the centuries. Since 2015, the Feldkirch Ensemble has been listed in the Austrian List of Cultural Heritage (cultural property protected by the Hague Convention). The city is also a member of the Association of small historic towns, a tourism marketing association. The streets of the Schlossgraben, Hirschgraben and St. Leonhardsplatz marked the former course of the city wall surrounding the Neustadt area in the 13th century. The wall was largely rebuilt around 1500 and since 1826 in many places abraded. As long as Feldkirch was surrounded by a city wall and a city moat, one could enter the city only through one of the four gates. These city gates were called Bregenzertor or Nikolaustor, Bludenzertor or Schultor, Milltor or Sautor, and Churertor or Salztor. The last two gates are still standing, the other two were removed together with the city wall at the beginning of the 19th century. Schattenburg: The Schattenburg castle was the seat of the counts of Montfort until 1390. The first construction phase began around 1230 under Hugo I of Montfort, the founder of the city. Under Count Friedrich von Toggenburg (1416–1436) and under the Vogt Hans of Königsegg extensions and transformations of the Schattenburg castle were built in the 15th century. After the departure of the Counts, the castle was repeatedly put up for auction, and in 1813 it was even to be demolished. Since 1825 the castle has been owned by the town of Feldkirch, which at that time acquired it for 833 florins. The castle then served as barracks and later as accommodation for the poor. The castle owes its rescue and revitalization to the Museum and Homeland Security Association for Feldkirch and the surrounding area which was founded in 1912. The upper floors are home to a museum of local history that attracts about 25,000 guests annually. Ruins of Tosters: The ruins of a hill castle on a hillside part of Schellenberg in the Feldkirch district of Tosters in the Austrian state of Vorarlberg. Palais Liechtenstein: In today's form, the house was built in the Schlossergasse No. 8 after the town fire of 1697 as an office building for the prince Johann Adam Andreas of Liechtenstein in baroque style. In 1848 it became the property of Andreas Ritter of Tschavoll, at that time Feldkirch mayor and manufacturer. The town acquired the palais in 1967 and today the building is used as an exhibition center. It is home of the cultural council, and also the seat of the city library as well as the city archives. In the 19th century the Feldkirch bourgeoisie built a number of prestigious residential buildings, most of which are still privately owned. The villas were built mostly on the Reichsstraße and here mainly in the area between the Bärenkreuzung and the train station. The Poolbar Festival is a modern music and culture festival in Feldkirch. Being held annually between July and August, it attracts around 20,000 visitors featuring music, exhibitions, poetry slams, fashion and an architectural prize. Feldkirch is the home of the Feldkirch Festival, an annual summer festival founded in 2002 by Thomas Hengelbrock and directed since 2007 by Philippe Arlaud. Feldkirch has a humid continental climate (Dfb). See also: Category:People from Feldkirch, Vorarlberg. P. Georg Sporschill SJ (born 1946), pastor known for his social engagement for orphans and street children in Romania and Moldova and work with the homeless in Vienna. Hans Weingartner (born 1970), author, director and film producer (famous for the international hit The Edukators starring Daniel Brühl and Julia Jentsch). ^ Smith, Digby (1998). The Napoleonic Wars Data Book. London: Greenhill. pp. 146–148. ISBN 1-85367-276-9. ^ "Small historic towns". Archived from the original on 2016-03-24. ^ Salzburg. "Local history of Feldkirch - Small historic towns". www.khs.info. Retrieved 2017-07-21. ^ Salzburg. "Sights in Feldkirch - Small historic towns". www.khs.info. Retrieved 2017-07-21. ^ "Schattenburg-Museum Räume". www.schattenburg.at (in German). Retrieved 2017-07-24. ^ "Palais | Kunst Palais Liechtenstein". www.palaisliechtenstein.at (in German). Retrieved 2017-07-24. ^ "poolbar Festival". poolbar Festival (in German). Retrieved 2019-03-03. ^ "Weatherbase: Historical Weather for Feldkirch, Austria". Weatherbase. 2011. Retrieved on 24 November 2011. Wikimedia Commons has media related to Feldkirch. Wikivoyage has a travel guide for Feldkirch. This page was last edited on 26 March 2019, at 15:05 (UTC).